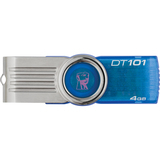 Kingston DataTraveler 101 Generation 2 (G2) is here! This convenient storage companion lets you take all of your data to your home, office, school and anywhere you travel. Now with urDrive, it gives you a better way to look at your data while combining cool features to make it your own. Easily store, organize and share your favorite photos through the built-in photo viewer, search the convenient built-in Internet browser and view the cool AppZone for new apps to try all in a flash. In the months ahead, urDrive will update to offer even more apps and features.